I don’t know why I put this off so long: maybe it was knowing it was set in the publishing world. That sort of roman à clef doesn’t usually appeal to me much — possibly because there is nothing much that will surprise me about the publishing world anymore. 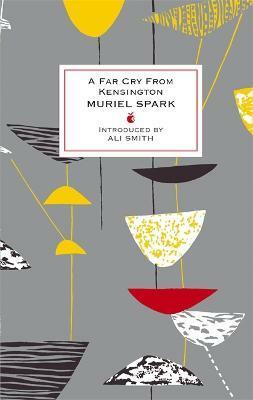 But dashing off on the train to meet the fab QoE (still need to write that up) and needing something to read, I wanted more #MurielSpark100 so I grabbed this from the shelf. An unfortunate cover: I see what they were trying to do but it doesn’t really work. So many other lovely versions like this. How great is that? Then she goes on to explore her late night thought process and it’s just wonderful, of course. Written as a memoir by the main character, Mrs Hawkins (surely a nod to Waugh’s Nanny Hawkins), life is a far cry from the rooming house in Kensington that she lived in during the post-war period. Everyone confides in the ‘comfortable’ woman who describes herself as ‘massive’ and ‘hefty’ until ‘I decided to be thin’ (a whole other post on Spark’s obsession about weight will have to be written by someone else). Though not old, everyone treats her as if she were. Both the house in Kensington and the odd publishing house Hawkins works for are superbly and exquisitely unique as Spark lays them out for us. Modern publishers would have a fit: the opening is all description of people and places, yet it sparkles. Ullswater and York sound like so many real publishers, and yet completely mad, too. The dissection of class is barbed and hilarious. The back and forth in time allow us to know about York’s imprisonment even while we see how he gets away with his crimes because he’s charming and has the right accent. So many things are going on–little dramas and tiny crimes–that it’s difficult to know what will carry on through the novel and what is merely an episode, which is how Spark surprises you all the time. But she creates one of the all time worst authors in soooo many ways: ‘At this point the man whom I came to call the pisseur de copie enters my story.’ Hector Bartlett is a terrible writer and a horrible man. She makes him absolutely unforgettable and worse than we even imagine. Anyone who has dealt with a horrible author will know him. Go read more Spark! I have her play up next, Doctors of Philosophy.